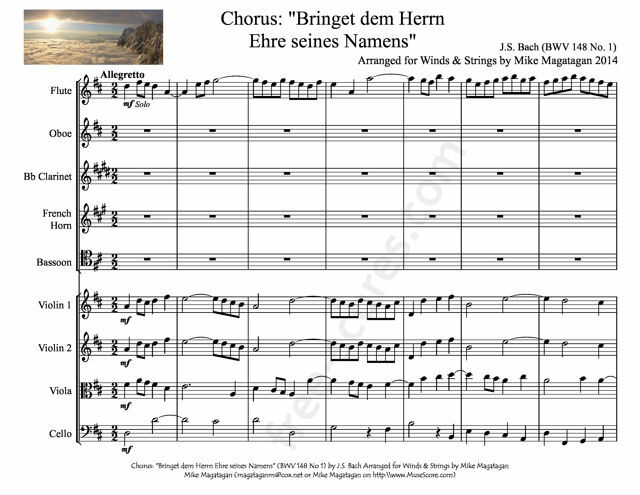 Bringet dem Herrn Ehre seines Namens (Bring to the Lord honour of His name), BWV 148, is a church cantata written by Johann Sebastian Bach probably in 1723 in Leipzig for the 17th Sunday after Trinity. Bach probably wrote the cantata in 1723 in his first year in Leipzig for the 17th Sunday after Trinity. The prescribed readings for the Sunday were from the Epistle to the Ephesians, the admonition to keep the unity of the Spirit (Ephesians 4:1–6), and from the Gospel of Luke, healing a man with dropsy on the Sabbath (Luke 14:1–11). The cantata text refers not to the healing, but to the honour due to God on the Sabbath. The words for the opening chorus are from Psalm 29 (Psalms 29:2). 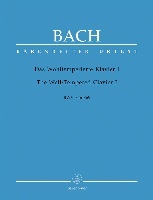 The lyrics of the cantata are based on a poem in six verses of Picander, Weg, ihr irdischen Geschäfte, published in 1725 in his first spiritual book Erbauliche Gedanken. The musicologist Alfred Dürr has nevertheless reason to date the cantata in 1723 already, suggesting that the cantata text may have preceded the poem, but there is no certain evidence that the cantata was not composed some years later. The first recitative describes the desire for God as in Psalm 42 (Psalms 42:1). Only the melody of the closing chorale Auf meinen lieben Gott (Lübeck, 1603) is known. Some musicologists including Neumann suggested the words of the fourth verse of that chorale, others such as Philipp Spitta and the edition of the Bach Gesellschaft preferred the final verse of Wo soll ich fliehen hin of Johann Heermann (1630) which was sung on the same melody in Leipzig. The opening chorus begins with as instrumental sinfonia, presenting the themes. The choir sings two fugues on different themes, but both derived from the beginning of the sinfonia. 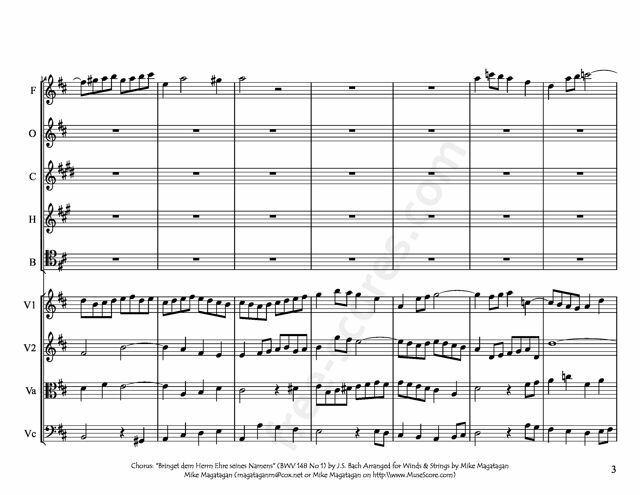 The trumpet plays a fifth part in the fugues. The movement concludes with the voices embedded in the sinfonia. The solo violin in the first aria illustrates both the joy in God and the Eilen (running) mentioned in the words. 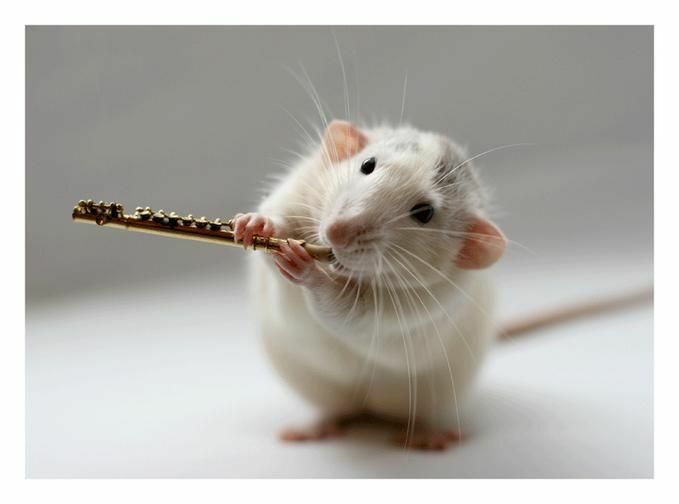 The alto recitative is accompanied by the strings. In the following aria the mystical unity of the soul with God is expressed in the unusual scoring for two oboe d'amore and oboe da caccia. The closing chorale is set for four parts. 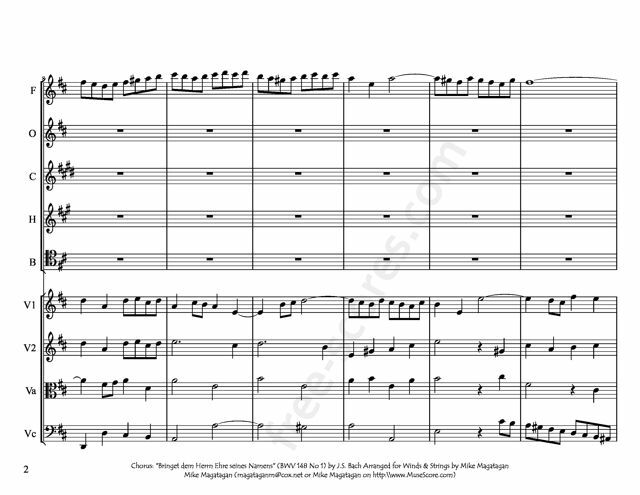 Although originally scored for alto and tenor soloists, a four-part choir, trumpet, three oboes, two violins, viola, and basso continuo, I created this arrangement for Winds (Flute, Oboe, Bb Clarinet, French Horn & Bassoon) and Strings (2 Violins, Viola & Cello) & Strings (2 Violins, Viola & Cello).